Yes! 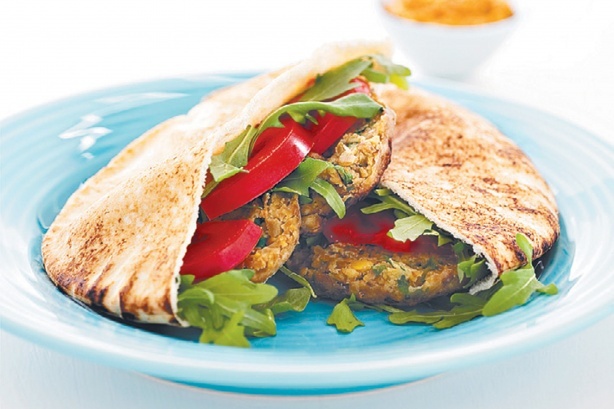 Another Vegetarian Burger Recipe..This time it’s the Cashew and Lentil Burger Recipe. This recipe is a bit less complicated than some of the others. There are less ingredients, but I still tend to bowl up to make things quick and easier. Most of the work is done by the food processor so it’s not that laborious. These are great for something different to try as a family any night of the week. Otherwise they provide a nice healthy alternative at gatherings suiting both Vegetarians and the health conscious. Even if the idea of a Lentil Burger has never attracted you before, you have to try some of these burger recipes. Who knows, you might like them! Enjoy..
Place the bread in a food processor and process until coarsely chopped. Add the cashews, egg, coriander, 1 tablespoon of sweet chilli sauce, salt and pepper and process until well combined. Add the lentils and process until well combined. Place the lentil mixture in a bowl. With damp hands divide the mixture into 8 portions. Roll and flatten each portion into a patty shape. Place on a tray lined with non-stick baking paper and refrigerate for 20 minutes. Heat a little oil in a large non-stick frying pan over medium heat. Cook the patties in batches for 4 minutes each side or until golden. Transfer to a plate and cover with foil to keep warm. While the patties are cooking, combine 2 tablespoons of sweet chilli sauce and yoghurt. Place the patties on serving plates. Serve with the sauce and a simple salad.